Boy Kings Treasure Video Slot Guide & Review - Casino Answers! Boy King’s Treasure is a 5-reel, 20-line video slot developed by Realtime Gaming, featuring a wild substitute symbol, scatter wins, multipliers, a free spins feature and a progressive jackpot. You can play the Boy King’s Treasure Real-Series Video Slot at Bovada. Bets on the Boy King’s Treasure slot machine are $0.01, $0.02, $0.03, $0.04, $0.05, $0.06, $0.07, $0.08, $0.09, $0.10, $0.25, $0.50, $1, $2.50 and $5 per line. 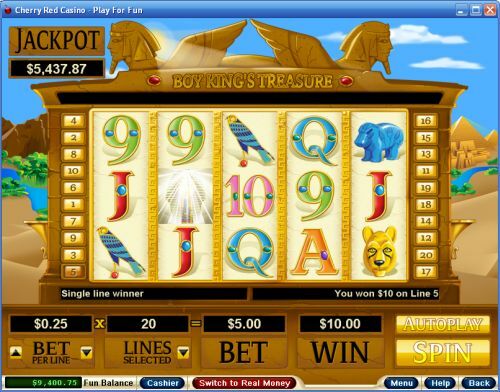 You can select from 1-20 paylines on a spin in Boy King’s Treasure. You can bet as little as a penny per spin on the Boy King’s Treasure slot game up to the maximum total bet of $100 per spin. Boy King’s Treasure has a good betting range, which both low stakes and high stakes players can enjoy. For those who wish to manually skill stop the reels, you will be able to by hitting the “Stop” button in the middle of any spin you make. To play the Boy King’s Treasure video slot, select your bet and hit the “Spin” button. The highest paying symbol on the Boy King’s Treasure online slot game is the Bracelet symbol. If you hit 5 Bracelet symbols on a selected payline in Boy King’s Treasure, you will win the 1,800 coin top fixed jackpot. When the King Tut symbol substitutes in a winning combination, it will double your winnings so you can actually win up to 3,600 coins. The second highest paying symbol is the Lion symbol, which can pay out up to 1000 coins on its own or 2000 coins with a wild substitute symbol. The King Tut symbol is the wild substitute symbol on Boy King’s Treasure. It will substitutes for all other symbols except for the Scattered Snake symbol. When the King Tut wild symbol substitutes in a winning combination, it will act as a 2X multiplier, except during the free spins feature, which can only be multiplied up to 16X. The scatter symbol on Boy King’s Treasure is the Snake symbol. If you hit 3, 4 or 5 Scattered Snake symbols anywhere on the reels, you will win 5X, 25X or 150X your total bet and 15 free spins. During the free spins feature, the King Tut wild symbol can multiply your winnings up to 16X. Free spins are played at the lines and bet of the triggering game. The free spins feature can be re-triggered. Boy King’s Treasure features a progressive jackpot, which at this time is at $5,400. The progressive jackpot is won at random and can be won on any spin you make, even losing spins. You can play for the Boy King’s Treasure Progressive Jackpot at Bovada! Wins on different paylines are added. Scatter wins are added to payline wins. Payline wins are multiplied by the bet per line. Only the highest win is paid per line. Maximum win per paid spin is 50,000 times bet per line. Hit the “Autoplay” button to open the autoplay settings. You will be able to set the number of spins, set it to stop when the jackpot is won, stop if a win exceeds or equals (any amount you input), stop on any win, stop if your balance increases/decreases by any amount you input and stop once the feature is triggered. You can stop the Boy King’s Treasure autoplay mode using the “Stop Auto” button to deactivate it. Boy King’s Treasure looks great with some excellent sound effects. The fixed payouts aren’t great, but this is made up for by its progressive jackpot. You can play the Boy King’s Treasure video slot when you sign up and make a deposit at Bovada. Can players from the United States play the Boy King’s Treasure online slot? Yes, American players are welcome to play the Boy King’s Treasure slot game for real money. American players can play this video slot at Bovada. Where can I play a Boy King’s Treasure free Flash game? Unfortunately, the RTG Instant Play casinos do not offer the Boy King’s Treasure slot machine. You can play other King Tut and Egyptian slot games in Instant Play mode at Bovada.